Have you heard these new guys? Globe Telecom and KakaoTalk Philippines is giving away 1 Samsung Galaxy S4 everyday starting October 10 up to November 8. Sounds great right? 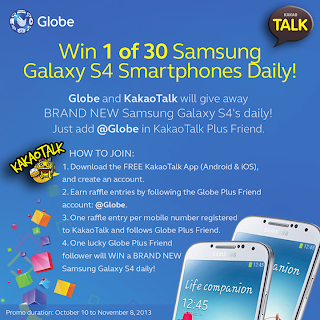 If you’re using KakaoTalk with Globe then here’s your chance to be pick as one of the winner on this brand new handset. Mechanics is just simple guys, if you’re already a Kakaotalk user then you can skip step 1 and if not then just comply with the listed below mechanics to be able to participate this promotion. How to join this Galaxy S4 giveaway? Download Kakaotalk Android and iOS for free, install and create your account. By following Globe Plus Friend account @Globe you automatically earn a raffle entry. Do note that only one entry per mobile number account registered on Kakaotalk and follows Globe Plus Friend. That’s it guys, good luck. If you’re not a Kakaotalk user and want to get a chance to win Samsung Galaxy S4 there’s an affordable way to get connected with KakaoTalk with Globe. Just register to Globe promos where this chat app is bundled like GoUNLI30, KAKAOTALK20 and UNLICHAT25. You can also add me if you want, just search my ID ‘panic420’. Feel free to share this post to your friends on Facebook and other social sites.